Are highly sensitive people more prone to illness? 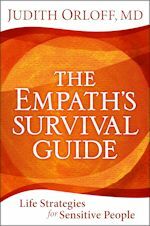 Yes, sensitive people, whom I call empaths in The Empath’s Survival Guide, are more prone to symptoms and empathic illness because they tend to be acutely sensitive and absorb what is around them in their environment. Empathic illnesses are those in which you manifest symptoms that are not your own. Many patients have come to me labeled“agoraphobic” with panic disorders, chronic depression, fatigue, pain, or mysterious ailments that respond only partially to medications or psychotherapy. Some were nearly housebound or ill for years. They’d all say, “I dread being in crowds. Other people’s anger, stress, and pain drain me, and I need a lot of alone time to refuel my energy.” When I took a close history of all these patients I found that they were what I call “physical empaths:” people whose bodies are so porous they absorb the symptoms of others. As a sensitive person, it’s vital that you practice the strategies I suggest in the book to manage your energy such as clear boundary setting, alone time, meditation, being in nature, calming yourself down–all this decreases stress, which can help your health issues!